As with any health condition treatment, the effectiveness of a particular treatment should be evaluated continuously over the life of the patient. For example, a patient being treated for hypertension with a certain medication will almost certainly need to have their medication changed or adjusted over time. Aging, activity level, diet, physiologic and endocrine conditions, and medication(s) will all affect the long-term outcome of weight loss surgical procedures. A particular bariatric surgery some years ago may have been effective in maintaining a patient’s weight loss at that time, however, over time the patient may experienced weight regain, recurrence of co-morbid conditions, or onset of new obesity related co-morbidities. Any of these reasons may be enough to consider revision of a previous weight loss surgery. Duodenal Switch is a hybrid surgical procedure that has two aspects that reduce weight, restriction and limited absorption. Duodenal Switch maintains the pyloric valve and the gastric and intestinal junction, which eliminates dumping syndrome, marginal ulcers, and stoma issues that are associated with Gastric Bypass. Duodenal Switch has the highest excess weight loss and maintenance of all available weight loss surgeries at this time. Check out a comparison chart of the weight loss surgery procedures and outcomes. 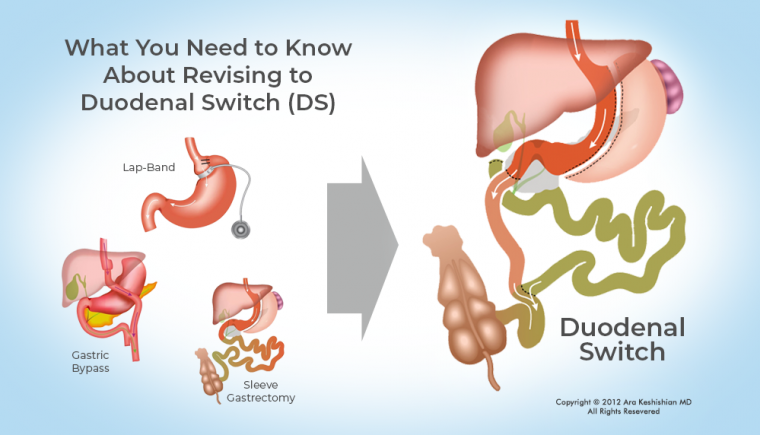 Duodenal Switch, as described by Dr. Douglas Hess, using a percentage based method for constructing the intestinal limbs offers the most individualized and customizable weight loss surgery. 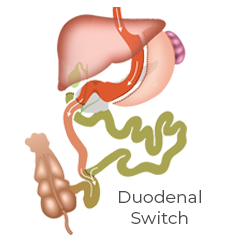 Duodenal Switch is the most effective option for people with metabolic disease processes such as Diabetes, PCOS, Hypertension, Hypertriglyceridemia and Cardiovascular Disease. 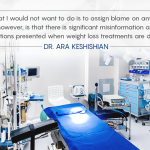 It is also effective for people who have had previous weight loss surgeries and are considering Revisional Weight Loss Surgery due to regain, complications or inadequate weight loss. The phrasing of Single Anastomosis Duodenal Switch or Loop Duodenal Switch is misleading because of a well-defined description for Duodenal Switch. I will discuss the SIPS/SADI revision to the Duodenal Switch below. Complications of the previous weight loss surgical procedure. 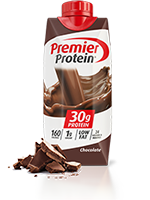 Adherence to Vitamin and diet requirements. The answers to these questions will dictate the choice of the surgery. The goal of revising a weight loss surgery is to balance the potential risks of the operation against the benefits. 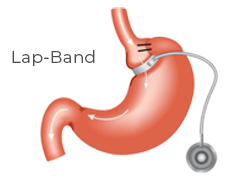 A patient who may have lost weight with Adjustable Gastric Band may also be experiencing significant and persistent nausea and vomiting years after the device placement. It has been shown that patients with Adjustable Gastric Band may not do as well if revised to the Sleeve Gastrectomy (VSG). This patient should consider a revision to the Duodenal Switch with a larger sleeve or revision to the Gastric Bypass. later to have the Duodenal Switch procedure performed. Revision surgery of patients, who have had Gastric Bypass and after a few years of maintaining weight loss are experiencing weight regain, is common in our practice. Dilated pouch or dilated stomach to the small bowel anastomosis and poor diet have all possible explanation some patient gaining weight after Gastric Bypass. It has been demonstrated many years ago that the size of the pouch or the anastomosis was not a factor in determining which patient would experience weight regain and which would not. We now know that revision of the pouch or the gastrojejunostomy anastomosis does not result in any significant additional maintained weight loss. 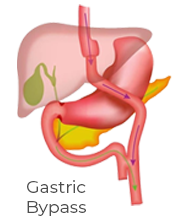 Conversion off the proximal Gastric Bypass to the distal Gastric Bypass can have dire nutritional consequences. 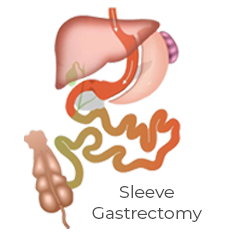 Sleeve Gastrectomy procedures are also revised to the Duodenal Switch operation frequently. The weight loss with the Sleeve is less than that of the Duodenal Switch, and an addition of a malabsorption component, done correctly with Hess method, can deliver health benefits as well as additional weight loss. The addition of the Duodenal Switch component is a rather straightforward proposition following the failure of a Sleeve Gastrectomy procedure. down and redone. This results in possible three staple lines, which increases the risk of a leak and adhesions. As I have been vocal about previously, Buyer beware when it comes to the SIPS/SADI procedures being presented as the Duodenal Switch. These procedures are not the Duodenal Switch. Regardless of which procedure is being revised from, patients having the Duodenal Switch operation need to be aware of the some of the unique challenges that come with this very effective operation for weight loss and co-morbidity resolution. Each patient must take life long multivitamin, Calcium and other mineral supplementations based on their yearly laboratory studies. Fat soluble vitamin deficiencies (Vitamin A, D, E, and K ) are seen in Duodenal Switch patients requiring supplementations with dry or water miscible forms of these supplements. A dietary indiscretion with high-carb, high-fiber, and a high-fat diet may result in frequent bowel movements, and the resultant malabsorption of minerals, complicating the supplementation described above. The adherence to these requirements is paramount. Dr. Ara Keshishian is Director and Surgeon at Central Valley Bariatrics. He has performed more than 2,000 Duodenal Switch procedures and 500+ revisions from other procedures such as RNY, Lap-Band & VSG to the DS since 1999. He has published several research articles on weight loss surgery topics. Dr. Keshishian and team work hard to change how people feel about themselves, improved health, self-esteem and wellbeing. 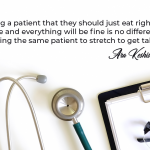 Read more articles from Dr. Keshishian! Diets Don’t Work, Why Bariatric Surgery Does!